Levi Claridge is a litigation associate with the firm where he represents clients in a wide range of matters before state and federal courts. He focuses his practice on insurance defense, insurance coverage and bad faith, products liability and transportation. Levi is a native Arizonan who received his undergraduate and law degrees from the University of Arizona. During law school, Levi was the Note and Comment Editor for the Arizona Journal of International and Comparative Law, was a member of the J. Reuben Law Society, received a CALI Award in Regulation and Antitrust while maintaining a spot on the Dean’s List all semesters. 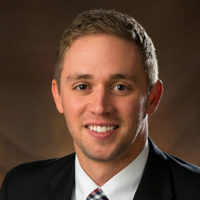 After law school, Levi worked as a law clerk for the Honorable Stephen M. McNamee of the United States District Court for the District of Arizona. Outside of the practice of law, Levi enjoys traveling with his wife, being outdoors and competing in triathlons.